As the 1970s progressed, additional legislation was passed by the U.S. Congress to assist in the reorganization of the railroads. 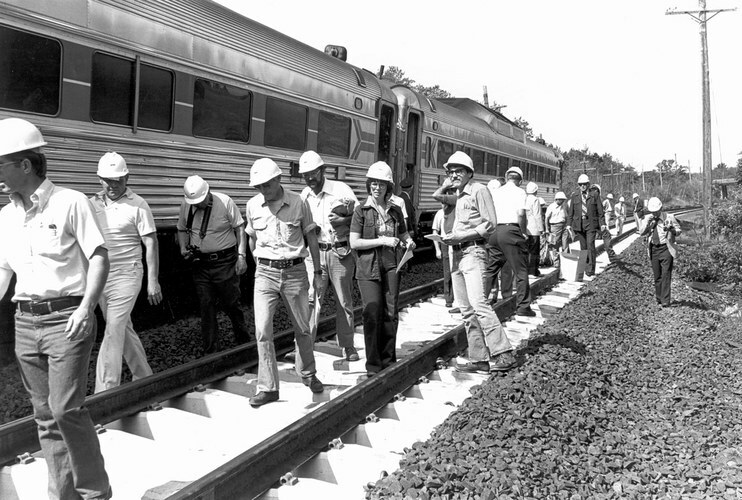 Debated during late 1973, the Regional Rail Reorganization Act was signed by President Nixon in early January 1974. It set out procedures for restructuring the rail system in the Northeast and Midwest, where the bankruptcy of Penn Central and six other railroads threatened to create turmoil. A shutdown of these railroads would affect Amtrak, which ran over their trackage, while also hurting regional economies by preventing the timely movement of goods. The bill established the United States Railway Association to plan and finance the restructuring, as well as to oversee the creation of a Consolidated Rail Corporation (CRC) to operate and modernize parts of the new system. Although focused primarily on freight rail, the act did benefit Amtrak by providing funds for the upgrading of the Northeast Corridor between Washington and Boston. The goal was to achieve two-hour service on the south leg (Washington-New York) and a two-and-one-half hour trip time on the north end (New York-Boston). To attain these benchmarks, Amtrak was allowed to purchase or lease properties in the Northeast from the CRC. Improvements would include installation of welded rail, modernization of the electrical system, and the purchase of rolling stock. In a statement made upon signing the act, President Nixon commended “…members [of Congress] from all regions of the country [for] treating this legislation as an important national issue and not simply as a Northeast problem.” Over the next few years, more than $2 billion in federal funds would be used to modernize rail infrastructure in the Northeast. As a result of the legal proceedings and reorganization that followed, Amtrak eventually gained control over the Northeast Corridor. The Amtrak Improvement Act (AIA) of 1973 adjusted the Rail Passenger Service Act of 1970 to include changes to the compensation that Amtrak paid to host railroads. The AIA also allowed the Secretary of Transportation to designate one new passenger route per year to be operated on an experimental basis. To improve the existing fleet—composed of a mix of cars inherited from predecessor railroads—Amtrak ordered new diesel and electric locomotives, as well as “Metroliner-type” cars (later known as Amfleets). With the financial assistance of the federal government, Penn Central had initiated the electric, high-speed Metroliner service between Washington and New York in 1969. Luxurious cars and a running time just under three hours made it a viable competitor to regional airlines. Newly formed Amtrak took over the service and subsequently added additional frequencies. In 1973, Amtrak let a contract to specify and design new bi-level cars. Later known as “Superliners,” they would be used primarily on western routes since older tunnels and bridges in the east imposed height restrictions. The Amtrak Automated Reservation and Ticketing System—ARTS for short—was put into limited operation. It eliminated the need to hand write all ticket reservations, thereby saving time and reducing the risk of lost paperwork. By mid-1974, ARTS was in full operation, fulfilling the promise of a truly national reservation system using the most modern technology. The energy crisis, driven home by the OPEC oil embargo of 1973, encouraged Americans to rethink how they used energy and natural resources. In response, Amtrak began a new advertising campaign with the slogan of “Save energy—take our car.” In the coming years, passengers new and old would take Amtrak up on its offer, driving up ridership and putting stress on the existing fleet.